Federal and state governments provide tax incentives for filter technology development. With increasingly stringent clean air requirements and widespread concern over biological ecosystems, filtration technologies are rapidly developing. 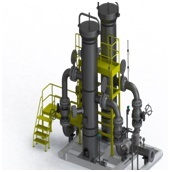 Innovative filtration solutions increase performance and reduce operating costs. The wide assortment of materials, debris, and compounds that need to be filtered in any given setting is enormous. The scope of materials, designs, and combinations that can be used to create a filtering mechanism for any different application is practically infinite. Filter technology has come a long way since filter patents first attracted widespread industry attention in the tobacco market in the 1920’s. Large filter manufacturing companies like Pall Corp, smaller ones like filtration group, the federal government and Universities like UCLA are all constantly developing filtering technologies, investing billions in R&D. They have scientists, engineers and chemists constantly developing patents and improving existing technology for new applications. These activities are often eligible for substantial Federal and State R&D tax incentives which are discussed in the column on the right. Bio-filtration is a relatively new and emerging technology. It involves using living material to capture and biologically degrade pollutants. Bio-filtration is generally applied to wastewater treatment and other toxic compounds, as well as fish tanks and aquariums. It also represents a partial solution to the growing worldwide water shortage issue. One billion people around the globe lack access to an improved water supply. In excess of two billion people lack access to improved sanitation. Consequently, there is an overwhelming amount of nitrogen pollution in fresh water supplies, worldwide. Many rivers, lakes, and other freshwater sources are becoming increasingly polluted by not only human waste but agriculture and industry waste. These sources represent a serious threat to maintaining manageable levels of nitrogenous and phosphorus waste in our water. 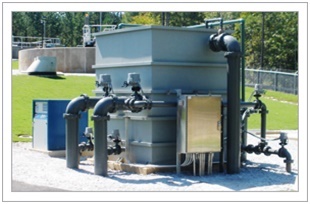 Besides wastewater treatment, there is a broad range of applications for bio-filters. Consequently, many studies have been done on bio-filtration in the last few decades. However, it is still difficult to explain the behavior of a bio-filter. The growth of different types of microorganisms in different working conditions makes it difficult to generalize the microbial activities of a given bio-filter. Because of the complex dynamics in any given bio-filtration system, designing them often involves a rigorous process of experimentation. The parameters that can affect the performance of a bio-filter are extremely widespread. A few of them include the characteristics of filter media, hydraulic and organic loading rate, and filter backwash techniques. Others include the temperature and the presence of oxidants, i.e. O3, H2O2, Cl2, and NH4Cl in the effluent. These factors should be carefully studied before designing a bio-filtration system. Some additional considerations are often taken into account by engineers such as designing products to fit within small spaces, establishing multiple functions, and filtering a diverse array of odors, toxic compounds, and VOC’s in any given setting. What’s more, different users have varying standards adding to the complexity. Given this complexity and the vast array of catalysts that may affect any given filter, designing bio-filters are often very R&D intensive. If the investigations involve new technology which they often do, it is likely that the activity will be eligible for the R&D tax credit. The EPA discusses some bio-filtration systems that it considers innovative below. The following technologies are relatively new to the market. Enough so that different variations will often trigger eligibility for R&D tax credits. The EPA has listed five tiers of technological innovation associated with waste-water management as also listed below. Most of the technologies in the first four tiers are likely eligible for R&D tax incentives. Research - Technologies in the development stage that have been tested at a laboratory or bench scale only. New technologies that have reached the demonstration stage overseas, but cannot yet be considered to be established there are also considered to be research technologies with respect to North American applications. Emerging - Technologies that have been tested at a pilot or demonstration scale, or have been implemented at full scale in 3 or fewer installations or for less than 1 year. Innovative – Technologies that have been implemented at full scale for less than five years or have some degree of initial use. Adaptive Use – Some technologies have been established for years, but their use has not been static. In some cases, an established technology may have been modified or adapted resulting in an emerging technology. In other cases, a process that was developed to achieve one treatment objective is now being applied in different ways or to achieve additional treatment objectives. Established – Technologies that have been available and widely implemented for more than five years. The WWETCO FlexFilter is a high rate filtration system that utilizes synthetic compressible media. The compression of the media is accomplished through a lateral hydraulic force applied from the incoming liquid. This unique method of compression eliminates mechanically actuated internal components and provides for a tapered compression. The varied porosity of the compressed media bed allows for increased filtering capacity as well as the ability to treat flow streams with higher solids concentrations while minimizing backwash cycles. In addition to the filter's ability to handle higher solids, the backwash system, with air scour and specialized backwash troughs, minimizes the volume of backwash water needed. The combination of media compression method and backwash system makes the WWETCO FlexFilter one of the most versatile and efficient filters on the market. The WWETCO FlexFilter is a simple gravity system requiring no moving parts. The influent liquid applies a hydrostatic force to the compression bladder causing the media to compress. The tapered compressions provide for densely compressed media at the bottom that graduates to an expanded bed toward the surface. As the liquid flows onto the top of the media, the larger particles are trapped in the upper portions of the filter. As the liquid works its way down, the smaller particles are captured. This porosity gradient within the filter bed allows for a more effective use of the entire media bed and allows for a higher mass load to the filter prior to backwash. For the backwash component, the feed to the filter is stopped, allowing the media to uncompress. The air scour is initiated along with a small amount of backwash water. The length of the backwash cycle is adjustable. Once cleaned, the filter is put back into service. The WWETCO FlexFilter technology is superior to established technologies in several respects. First, ramp up time is significantly reduced while performance objectives are maintained. Second, it requires no chemicals. Third, odor issues associated with many filters are eliminated. Finally, the footprint for the WWETCO filter is roughly half that of existing technology. Multi-stage filtration is a technology that uses a multi-stage approach to make water disinfection more efficient and effective. Many of the water treatment plants that are being developed involve innovative technology that ultimately involves R&D. The City of Bloomfield, NM recently used the technology to solve a problem associated with volatile water levels occurring during thunderstorms at one of its water treatment facilities. The city requires that turbidity levels (a measure of the degree to which water loses its transparency due to the presence of suspended particles) be maintained below a certain level. "The main reason it [the old system] failed was because there wasn't adequate pretreatment to address the rapid changes in turbidity that can be experienced with afternoon thunderstorms in the summer," said Mike Brewer, Senior Project Manager at CH2M Hill. The city chose to install the Trident HS Package Water Treatment Plant which uses the multi-stage Filtration process to treat the water. The innovation lies in the system’s multi-barrier design. Barrier 1 consists of a section for removing bulk solids. Barrier 4 is UV disinfection. The final selection was based on the equipment’s ability to meet the regulatory standards; ease of operation and maintenance; and ability to be easily expanded to meet future population growth. The EPA distinguishes the multi-stage filtration process from the single stage based on the better effluent quality that multi-stage process provides. Nanotechnology is the science of manipulating matters on a molecular or atomic scale . Nano-filtration (NF) is a process by which water and other fluids are pressurized through a membrane in order to separate undesirable products such as salt water on molecular level. 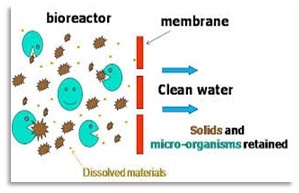 Reverse Osmosis (RO) is the process of forcing a solvent from a region of high solute concentration through a semi-permeable membrane to a region of low solute concentration by applying pressure. This is opposed to forward osmosis in which water moves from low to high solute concentration. 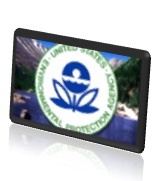 Both nano-filtration and reverse osmosis are described by the EPA as innovative. Even though the technology has been around for some time, most new designs contain many innovative characteristics . RO operates by high pressure diffusion of solutes through the membrane; NF uses both diffusion and sieving action. NF removes many of the same organic compounds that would be targeted with RO but allows more of the inorganic material to remain. Both processes are used for removing priority organic pollutants, recalcitrant organics, bacteria, and viruses. Recently, NF and RO have been considered as technology to achieve low levels of total nitrogen. However, recent research has determined that even RO does not consistently achieve total nitrogen levels less than 1.0 mg/L. Both are useful for removing pesticides, pharmaceuticals, hormones, and other micro-constituents. NF and RO are primarily used where water reuse is the treatment goal. Typically, micro-filtration or ultra-filtration is used as a pretreatment process for water that is required to be treated through NF or RO. The membranes are typically made of cellulose acetate or aromatic polyamides and are spiral wound and hollow fiber. NF is operated at lower pressures, so it uses less energy than RO. Both require membrane replacement as trans-membrane pressure increases from fouling. Micro-filtration and ultra-filtration membranes (which are the traditional technologies) are used for membrane bioreactors where the membrane is in direct contact with the high solids mixed liquor. These membranes provide excellent removal of particulate and colloidal material but cannot remove dissolved constituents as can NF and RO. NF and RO remove total suspended solids, total dissolved solids, and other pathogens better than the ultra-filtration process. The technology is much newer than reverse osmosis and is still undergoing substantial developments, more so than reverse osmosis. Forward osmosis systems, although not as common as reverse osmosis systems offer innovative solutions to challenging situations. One benefit is that a forward osmosis plant can recover 80% of the salt water that is processed through the system. This is a 30% improvement over the 50% recovery rate in a typical reverse osmosis plant. Phosphorus is an elemental nutrient in agriculture. There is a strong demand for it in the production of fertilizer and subsequently, a growing shortage of it as well. The good news for fertilizer users is that municipal wastewater often contains high levels of it that must be removed in order to make water potable. The biological recovery method for extracting the inorganic phosphates in order make the most efficient use of them are often innovative as described by the EPA. The biological method allows a larger portion of phosphorus to be released during anaerobic digestion and effectively utilizes the product as a fertilizer. This is in contrast to traditional methods of phosphorus removal where the phosphorus by-product is nothing more than mere waste product. Sedimentation is the process of allowing particles suspended in water to settle out of the suspension under the effect of gravity. The particles that settle out from the suspension become sediment. In water treatment operations they are known as sludge. Ballasted flocculation is a chemical treatment process that uses continuously recycled media and a variety of additives to improve the settling properties of suspended solids. Magnetite is denser than suspended solids and sand, and it generates heavy, dense floc that settles rapidly. This allows otherwise ordinary clarifiers to be loaded at higher than typical rates while maintaining high quality effluent. The footprint of clarifiers used in this process is correspondingly small. The magnetite seed is recovered from sludge using a magnet instead of gravity, so recovery efficiency is high, and magnetite make-up requirements are low. As with other processes employed to chemically precipitate phosphorus, precipitation performance is limited by kinetic and stoichiometric factors. However, the nucleation, solids contact and ballast provided by the process combine to allow phosphorus precipitates to be removed very effectively once they are formed. Industrial filters include a very broad range of applications. Nearly every manufacturing operation involves the use of filters in some way. Farmers use them in their irrigation systems, in laying down seeds or fertilizer and in sorting their crops; asphalt plants use bag houses to suction dust from stones; and restaurants use exhaust systems to filter out exhaust from stoves. Some other more cliché uses of filters involve painting operations filters which are discussed below. Painting operations at industrial facilities emit large quantities of volatile organic compounds (VOCs) into the atmosphere each year. Most, if not all, of these VOCs are classified as hazardous air pollutants (HAPs) because they are known or suspected to be detrimental to human health. In addition, VOC emissions can contribute to formation of ground level ozone, a problem facing many urban areas across the country. A need therefore exists to develop an efficient and environmentally friendly system to treat paint booth emissions and to meet increasingly stringent environmental regulations. While conventional air pollution control technologies can be effective for paint spray booth applications, they are often energy intensive, create undesirable byproducts and may not be cost effective for treating the intermittent, high volumetric flow rates and low contaminant concentrations associated with booth operations. Innovative filter solutions are constantly being developed to address not only these environmental concerns but also to enhance performance of the sprayers while reducing both purchasing and maintenance costs of the filter. Paint Pockets Company in Omaha, NE has developed one of many innovative approaches to enhance performance in industrial, automotive, and aerospace applications. They boast that their filters knock down and retain more overspray than any other arrestor. The unique design involves three-dimensional “pockets” embedded in the front face of the filter that more than double surface area, allowing the arrestor to capture and hold large quantities of overspray. Additionally, the paint pocket arrestors have superior wet tensile strength so they won’t tear or sag when they are loaded with large quantities of overspray. Southwest Research Institute® (SwRI®), based in San Antonio, TX, evaluates filtration performance, solves filtration-related problems and assists in defining filtration requirements. Their area of focus is in automotive and aviation systems filtration. Automobiles contain a number of different filters i.e. oil filters, fuel filters, air filters, hydraulic filters, radiators and emissions filters. Airplanes contain even more. These filters must be designed to withstand various pressure levels, size limits, accessibility considerations and increasingly competitive industry performance standards. Each client has a differing need for a particular filter. Engineers at the facility must develop custom tests to meet specific client requirements. Other times clients will bring in failed filters. The engineers at the facility will disassemble the filter cartridge to evaluate individual components of the contaminant and determine the cause of the failure. University of California researchers recently invented a new membrane that promises to improve the efficiency and effectiveness of water filtration and desalination. Eric M.V. Hoek, Ph.D., assistant professor of civil and environmental engineering at the Henry Samueli School of Engineering and Applied Science, and UCLA’s California NanoSystems Institute, began developing his nano-composite membranes in 2003. The technology consists of specially designed nanoparticles embedded within the membrane. The nanoparticles soak up water like a sponge but repel contaminants such as dissolved salts, industrial chemicals and bacteria. These results in high purity water with lower energy consumption, in addition to longer-lasting, cleaner membranes that do not become clogged with impurities — a problem with conventional membranes. With increasingly stringent clean air requirements and widespread concern over biological ecosystems, filtration technologies are rapidly developing. The EPA discusses several technologies in which it describes as innovative in the 2013 Emerging Technologies for Wastewater Treatment. These technologies and many other innovations are often eligible for federal and state R&D tax credits.